This disappointing result enabled local rivals Uxbridge to leap-frog over Town to take sixth place in the crowded top half of the South Central League. Town dropped down to seventh on the same number of points as tenth placed Ashford. The visitors had begun the game on the front foot and before ten minutes were up had forced Aaron Bufton into three saves, the third being a particularly creditworthy effort, throwing himself in front of Luke Maguire’s blast from six yards out. Hanwell’s first serious threats came from two Louis Bircham corners, both punched away under pressure by Reds’ ‘keeper Paul McCarthy. As the quarter hour mark approached a deep, cross-field ball from Harry Rush found Louis inside the six yard box. Unfortunately for Town the wide man only half-connected with the ball. Two minutes later Uxbridge went in front, Matt Sinclair connecting with Dave Thomas’ powerful free kick into the box. Although the visitors were on top, Town levelled five minutes later with a goal from nowhere. Top scorer Tom Collins made himself some room outside the area and fired into the far corner, to the delight of the home supporters. Parity was short-lived however, and Uxbridge restored their advantage when Pink Tyrone sped down the flank and pulled the ball back for Mitchell Wiseman to score with a tap-in. The visitors went on to increase their lead shortly before the half hour mark. Matt Woods blocked Devante McKain’s clearance and crashed the ball into the net, off the crossbar, from fully twenty yards out. The game then entered a quiet spell with Hanwell having more of the possession and field position than earlier. Rhys Paul skilfully created some room for himself but his shot was off target. Louis then sent over two crosses in promising situations that were comfortably cleared. Then, just before the interval, a well-flighted Louis free kick was headed narrowly over the bar by Gareth Chendlik. The visitors almost caught Town cold at the start of the second half, Sinclair racing clear, but having his goal-bound shot diverted for a corner at the last moment. It proved to be a wake-up call for Town and six minutes after the restart they pulled a goal back. A ball into the area from Louis was met by Olly Duffy. His header into the six yard box found Gareth, who netted from close range. The match then became rather scrappy with neither side creating much in the final thirds of the pitch. The only noteworthy effort in this period fell to Rhys, but he shot over the bar after receiving the ball from Louis. As the final quarter of an hour approached the Hanwell management made their final two substitutions in an attempt to find an equalizer. However it was not to be, and Luke Maguire slipped the ball past Aaron in the seventy-ninth minute to complete the scoring for the afternoon. To their credit Town did not throw in the towel and Olly had an on-target header saved by McCarthy with five minutes to go. No further goal-mouth incidents ensued, and the game petered out to leave Uxbridge as worthy winners. 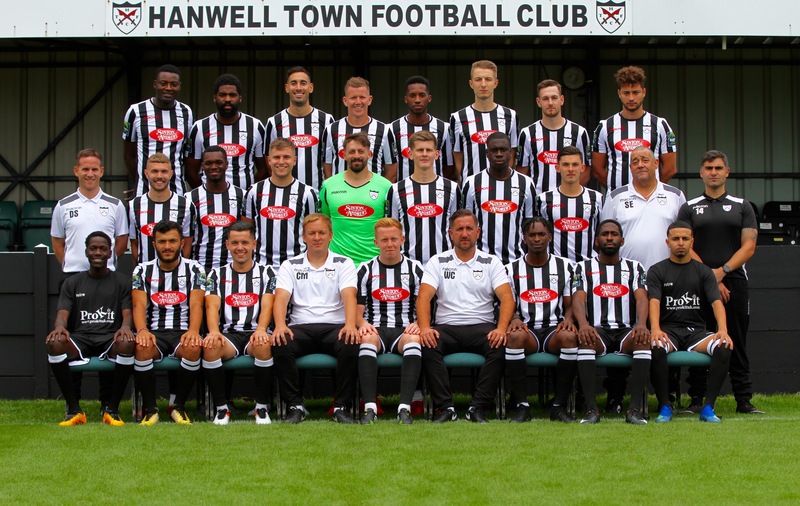 TEAM: 1.Aaron Bufton 2.Kieron Cathline 3.Williams Danquah (16.Harry Tamplin 26) 4.Olly Duffy © 5.Devante McKain 6.Rhys Paul 7.Louis Bircham 8.Harry Rush 9.Gareth Chendlik (14.Dylan Randall 73) 10.Tom Collins 11.Harvey Killeen (12.Malakai Mars 78). Unused substitutes: 15.Anis Nuur 17.Wayne Carter.